Detectives are probing about N117b suspicious transactions by the government of Rivers State in the last three years. The huge cash was intermittently withdrawn over the counter by a state official designated for the purpose, Economic and Financial Crimes Commission (EFCC) sources revealed. There were indications the money from the state accounts were laundered. But the state government yesterday described the probe as a “political witch-hunt” and vowed not to be intimidated. Four suspects have been shortlisted for interrogation in connection with the massive withdrawals. They include an official in charge of Finance and Accounts at the Government House in Port Harcourt and a cashier. The EFCC has detained a bank’s Managing Director (MD), who admitted that N5.2billion was realised as charges for the “controversial” transactions. According to the sources, the withdrawals were made in tranches of N10million with as many as 50 cheques cashed in a day. The sources said it was a case of “gross violation” of the Money Laundering (Prohibition) Act of 2011. One of the sources said: “Based on intelligence report, the EFCC swung into action. “Our findings indicated that the withdrawals were made in cash from the state accounts mostly by one person. There are no records of what the cash was used for. We are working on clues that it was diverted. 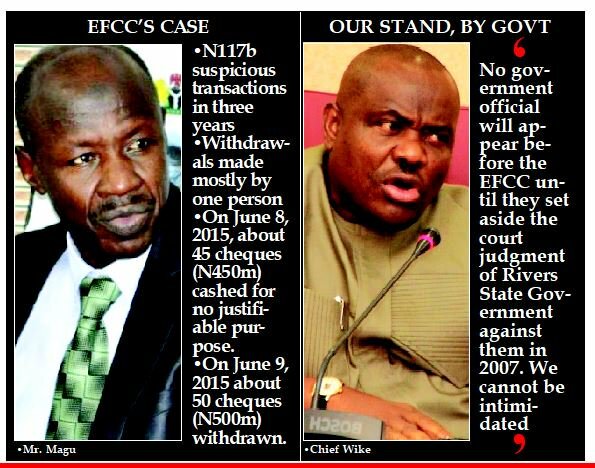 “The EFCC team has obtained all the records of the withdrawals, including date and time. For instance, on June 8, 2015 barely few days in government, about 45 cheques amounting to N450million were cashed over the counter for no justifiable purpose. Another source spoke of how a bank chief was quizzed last Thursday and released on administrative bail. “But he was asked to come back on Friday and we have been interacting with him up till Sunday. He admitted that all the withdrawals were made over the counter in cash. “He also said the bank benefited about N5.2billion from the charges collected on the transactions,” the source said. Another source said the bank was guilty of “lack of Suspicious Transaction Report (STR)” and violation of Money Laundering (Prohibition) Act 2011, especially sections on special surveillance on certain transactions and Limitation to make or accept cash payment. But the Nyesom Wike-led Rivers State government has insisted that they won't answer any questions from the EFCc on how they spend the state money, until a 2007 court judgement is set aside.